This is a unique pressure-sensitive adhesive in liquid form that bonds different materials including silicone rubbers and polypropylene with excellent removability. As this elastic pressure-sensitive adhesive comes in liquid form, loss of materials as a result of a die-cutting process and waste such as release papers will not be produced, so you can expect to improve your environmental friendliness and reduce costs significantly. 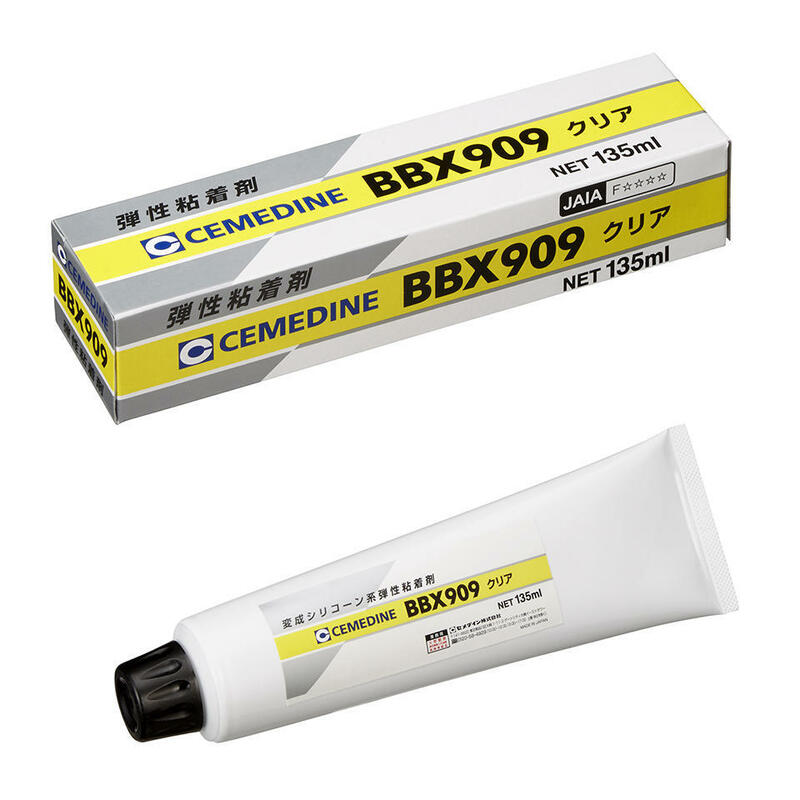 BBX909 (moisture-curing type) and BBX-UV300 (UV-curing type) are available. This product has two key features: it is an adhesive that sticks firmly, and it is a pressure-sensitive adhesive that never solidifies. 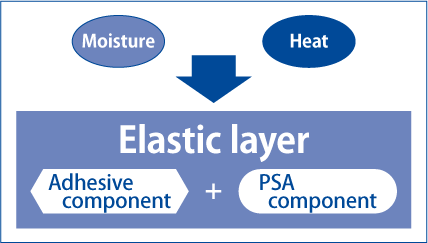 The product reacts to moisture contained in air (or UV radiation) to form a flexible, elastic film. As this pressure-sensitive adhesive is liquid, its “wetness” enables the surfaces to which it is applied to bond firmly, based on its adhesive property and tackiness property. The surface after open time exposure, however, bonds using the adhesive’s tackiness property only because the remaining adhesive property solidifies in reaction to the moisture (or UV radiation) contained within air. As a result, the adherend may be peeled from the tacky surface, which has a relatively smaller adhesion strength. In addition, since a resilient, highly stretchable elastic layer is formed, the adhesive may be peeled off neatly from the interface without cohesion failure. Although there are some exceptions, basically, BBX remains on the surface on which it was first applied. As BBX is liquid, if you apply it onto a rough surface, it will spread over the uneven texture, securing an effective application area. 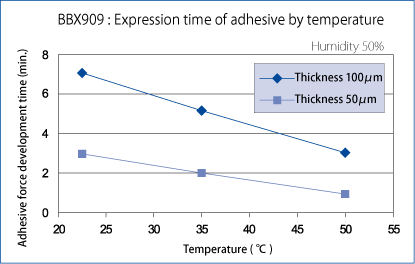 However, if you apply the adhesive onto a smooth surface and then bond it to a rough surface after curing, BBX will not spread sufficiently over the uneven texture, compared to when the adhesive was in a liquid state, because the adhesive surface after the curing reaction turns into a semisolid tacky surface (like the surface of double-sided tape). 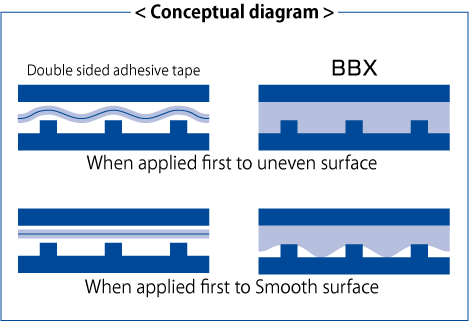 Nevertheless, as BBX does not use a base material like that of a tape, and the pressure-sensitive adhesive forms a resilient layer, if you apply the adhesive thickly, you can expect to increase the effective contact area compared to that of tapes in general, achieving a greater sticking force. Basically, the tackiness can be developed quicker under these conditions: thin-film application, high temperature, and high humidity. The adhesive was applied to one side of the adherend, and then bonded to another adherend after 1 minute of open time. The adhesive was applied to the PET film at a thickness of 100 μm, then bonded to another adherend after UV radiation. Standard: Time required to achieve a 180º peel strength of 5 N/25 mm or greater. The adhesive was applied to one side of the PET film, then bonded to a stainless-steel adherend after 30 minutes of open time. Test method: The materials were left in an environment under each temperature for 60 minutes, under 1-kg load. The displaced distance, or the time until the PET film dropped was measured. The adhesive was applied to one side of the adherend, then bonded to PET film after 30 minutes of open time. Testing method: The film was left for 60 minutes at 80°C under a load of 1 kg, and the distance of deviation, or the time until the PET film dropped from the test sample was measured.